I've been sitting and staring at the blank screen of my compose box for a while now.I write one sentence and then delete it and think of another.It hasn't happened to me very often so now I really do understand what bloggers mean when they say writers block-today is my turn of facing it. One thing that struck me after tasting the kurma was,how startlingly similar it was to the vegetable kurma I make(using my sil's recipe).How a base recipe gets different variations when shared through different people is something simply amusing.I followed the recipe to the T and made it using Cauliflower,you can try it with other veggies too. Clean the cauliflower florets,drain and keep aside. 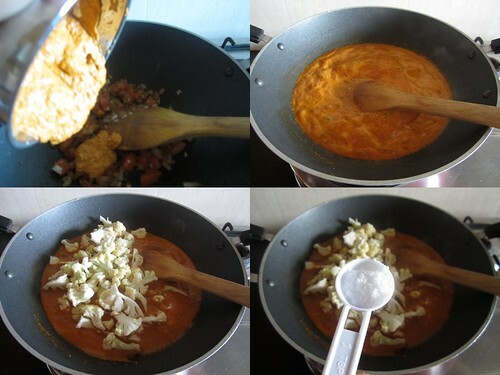 Make a smooth paste of the ingredients mentioned under the coconut paste-reserve. In a kadai add oil and saute onions till they start turning golden brown. 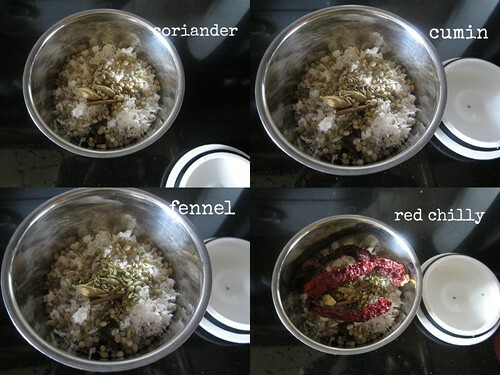 Mix in the ginger garlic paste and saute for 2-3 minutes. 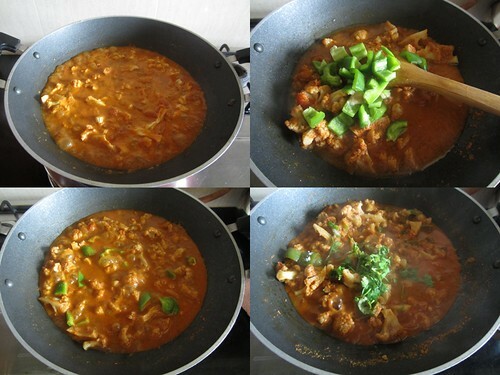 Add the chopped tomatoes and stir well,keep on simmer till the tomatoes start turning pulpy. 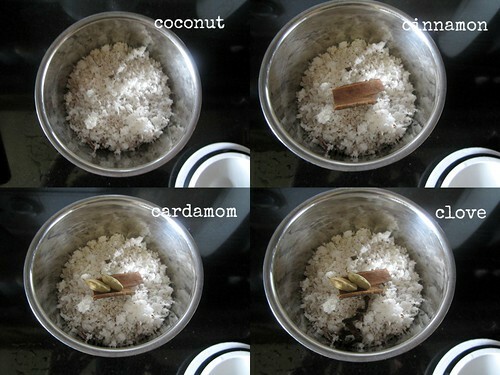 Now add the prepared coconut paste and about 1/2 a cup of water.Let it come to a rolling boil. Add another cup of water,salt to taste and the cauliflower.Boil for a minute then close with a lid and simmer it for 10-12 minutes or till the cauliflower is cooked but yet firm. 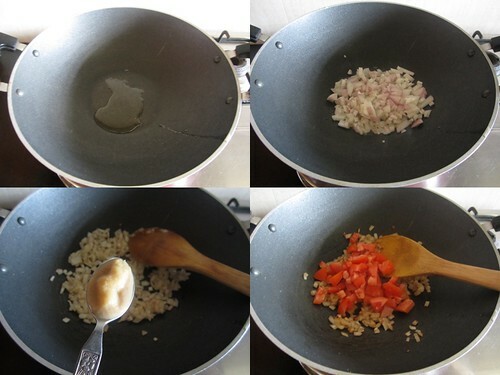 Open the lid and add the capsicum and cook for a further 2 minutes. Garnish with coriander leaves and serve hot with roti or pulao. You could make the kurma with vegetables like carrots,peas,beans and potatoes.I am thinking mushrooms too! 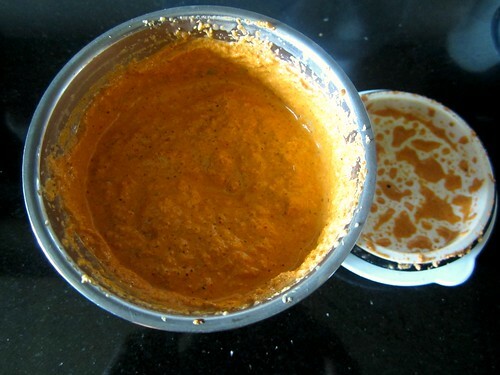 The gravy is a thick one,more like masala coated vegetables.So if you are serving the same with chapathi,add water during the cooking stage. That is one delicious kurma! love the step by step pictures. wow!! 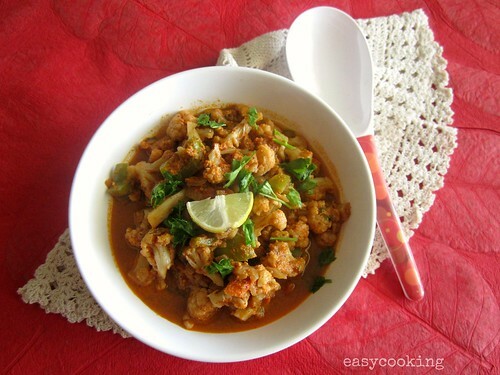 my favorite cauliflower kurma looks very tasty!!! Nice elaborate steps, kurma looks yumm!! Delicious looking Kurma ! Liked the step-by-step instructions. Just love, love , love your photos. What a lot of effort you put in your recipes. 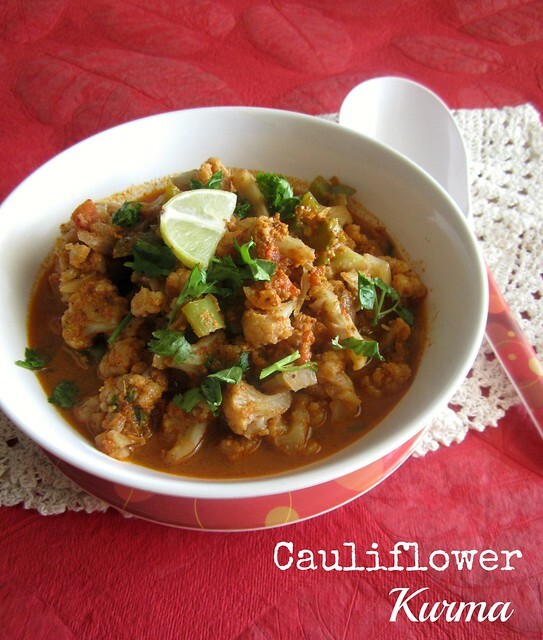 Cauliflower is my favourite veg so I certainly be trying this one. PS: Is that a Gulgulo in the previous post? Even this happens to me many times when i sit to write for a post. Fantastic and super tempting kurma, makes me drool. The kurma looks so good.. full of flavor! mmmmmm..... mouth watering dish. Love cauliflower a lot. Will try this out. Kurma..another fav in my house. Love the clicks and the recipe!